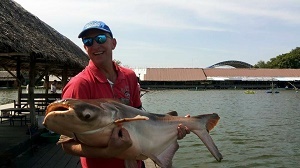 Visiting angler Marc decided to combine some fishing into his Thailand holiday. On arrival at Bungsamran Lake the angler was soon casting large balls of ground-bait towards the hordes of showing monster catfish. With Mekong Catfish crashing out all over the lake it was not long before one of his rods was away. Winding down into the fish saw it making a bee line for the far bank, stripping line from the spool at an alarming rate. The Mekong Catfish was beaten after a short ten minute battle and estimated to weigh 20kg. 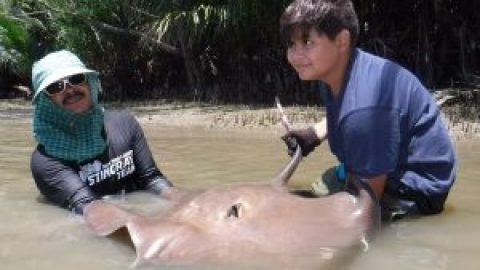 Marc and his family enjoyed non stop action throughout the day landing a succession of muscular catfish to 40kg’s. In addition to Mekong Catfish, the angler also landed several Striped Catfish with weights ranging between 8-12kg’s. At the end of the days fishing at Bungsamran Lake the anglers had amassed a 25 fish haul topped by Mekong Catfish to an estimated 40kg’s.